It's Sun vs. Moon in these innovative takes on seven classic games. Play Checkers, Chess, Reversi, Mancala, Backgammon, 4-in-a-Row and Tic-Tac-Toe against animated computer opponents, via email with friends, or online with opponents from around the world! 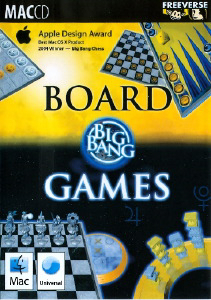 Big Bang Board Games are the start of a whole new universe of casual gaming. Visually stunning, the games not only play nice with Mac OS X programs like iTunes, Apple Mail, iChat and iSight, but incorporate them into game play to make the games as cool as the Mac itself. Built to work seamlessly with Mac OS X, these games talk to your "iApps" to give you the coolest computer board game experience ever! iTunes - Play and manage your iTunes songs within the games. Mail & Address Book - The games talk to your Mac's email program, making it simple to send game turns to friends. iChat - Your Buddy List appears within the game, so it's easy to invite a Buddy to a match. iSight - Share pictures with your buddies from within the game! GameSmith - Meet other players and go head to head via the free GameSmith matching service.